FlightSafety’s comprehensive helicopter training programs include reviewing and practicing routine, abnormal and emergency procedures. The procedures are practiced in a simulator under a broad variety of weather and environmental conditions and repeated without delays from air traffic, weather conditions or air traffic control. The pilot and instructor can focus on the task at hand without distraction in the safe and effective environment of a simulator. 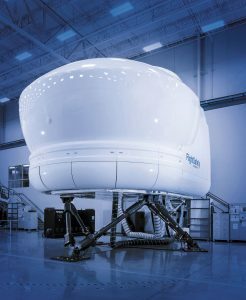 The advances in technology incorporated into the FlightSafety FS1000 simulator built for the Airbus Helicopters EC130T2 include FlightSafety’s industry-leading VITAL 1100 visual system and CrewView collimated glass mirror display. The glass mirror display allows for expanded field of view with superior image quality compared to Mylar display systems. The addition of collimated chin window displays adds further realism to the hover and landing phases and improves the ability to train maneuvers such as steep approaches and confined area landings. Its modular design produces the widest fields of view providing significant improvements in realism and situational awareness.